As humans, sometimes we become too carried away by our desires that we fail to see the role played by the obstacles on our ways. The fast and deserved desires of the people of Ambazonia are giving them a blind eye to the advantages acrueing from biya’s stupidity and hard heartedness. Biya seemingly is giving the people of the Southern Cameroons a good run for their independence struggle. Somewhere it is written that, a bad landlord is a good disappointment to a comfortable Tennant who has to build his own house. Also we are told somewhere in the Bible that it needed Joseph to be sold in Egypt for him to become king. These haters, enemies and and bad people only facilitate our journey up the success ladder. Still in the scriptures, the children of Israel had a Pharaoh, like Biya to challenge their efforts at every step of the way so that when they win, they can look back and cherish their efforts and their nation. Afterall nothing worth cherishing is given on a platter of gold. Ambazonians are working their arses for this game. It’s won already by forfeiture. Every step taken by the evasive and oppressive demons of Yaounde to hold down the destiny of Ambazonia only give the innocent people more resolve, energy, resilience, foresight, strategy and partners to get to her destination. 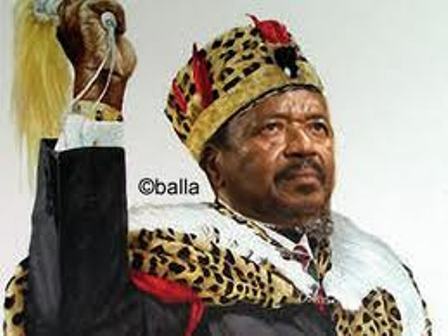 Many countries (genuine ones) like the U.S.A are turning away from biya because he is bad and stronghead like Pharaoh. Come to think of it for a moment, had Biya accepted Federation in the early days of the teachers and lawyers strikes, we won’t have had to see the promise land ( Ambazonian). He is one of the best ingredient for the full version of Ambazonian Independence. It surely won’t have been this better if a reasonable president had been leader of the Foreign La Republic Du Cameroun. Just like a football tournament, one stage passed deserves a congratulatory handshake to the opponent who never wanted your progress to the trophy. We of this platform congratulate biya’s barbarism in struggling to stop us. We are at the finals, Ambazonia versus Cameroun In all honesty, let the best team win. Be persistent, calm, pray and play your role genuinely whether as a fan or a team mate. Only the final whistle shall tell. bieya is a tall fool and a despot. bieya’s trust in bir to squelch peaceful Ambazonians in two weeks after declaring war on Ambazonia is giving him nightmares to the shame of france and east cameroun. What can be said – that a rag tag army in Amba land is holding the elite cameroun forces, the best trained in Central Africa at bay for more than three years? Ambazonians asked to be listened to, but bieya retorted in arrogance killing and imprisoning them. They asked for a federation, biya declared – the form of the state cannot be changed. arrogant fools like bieya do always forge ahead in futility and despair. one troll on this forum called Ambaland a face book country. Just learned that strangers are coming in from Europe to access and tell this fool that he is not capable of solving the Ambazonian crises. What NEXT???? Dear Mr Ekane, to my understanding you report unflinchingly and unbiased. Tell our our SBBC and ABC teams to be professional: report the stories unobjectically without taking sides from public views. If not our future media will be a media of division between our people.